This entry was posted in episodes and tagged a tribe called quest, bilal, bulal, busta rhymes, common, dabrye, de la soul, episodes, frank n dank, funkmaster flex, guru, j 88, j dilla, jay-dee, jaylib, keith murray, mos def, oh no, phat kat, platinum pied pipers, q-tip, que d, shaman work, slum village, truth enola, ummah by dex digital. Bookmark the permalink. Dilla is a genius and will be missed for a LONG time to come. Your mixtapes are great. Keep it up. Yo! missed u Dex anotha off da gold chain episode, 2 tone mixed it proper! J-dilla is smilin’ from da clouds, his genius lives on! can’t wait for part 2! 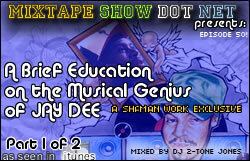 yo everyone – the link to Part 2 is right here – J Dilla Tribute Part 2. I know it got mixed up in iTunes – that’s my bad. It should be all fixed now. Thanks for the feedback though – keep it coming. And for those of you that dig the show and also happen to get it in iTunes, please consider taking a couple minutes out of your day and reviewing the Mixtape Show Hip-Hop Podcast in iTunes. It’ll help the Mixtape Show stay at the top of the charts, which is always a good thing. Also keep in mind who brought you these two joints. I know I’m crazy late on a comment, Dex (as always..LOL)..but I have to say..this is hands down my favorite episode…I wasn’t terribly familiar with Jay-Dee before this episode..but after hearing this episode I have since aquired just about everything he’s EVER done..and I’m like…”Oh wait..Jay Dee did that track? !”.as an up and coming beatmaker/producer myself I’m seeing I can learn alot from his style…. Greg – don’t be so sure you got everything dude ever made – a lot of it isn’t released! Speaking of which, stay tuned for some exclusives from the master himself..
Hi My Name Is ivateb. Whussup! People had to leave a message seeing as this whole show was dedicated to a gifted and blessed being, Dilla dog. With the original MIDAS touch live on through your music brotha. Lovin da show Dex. Bristol in da house baby an’ we out. ONE!! !